How do I find my iOS device's RAM? 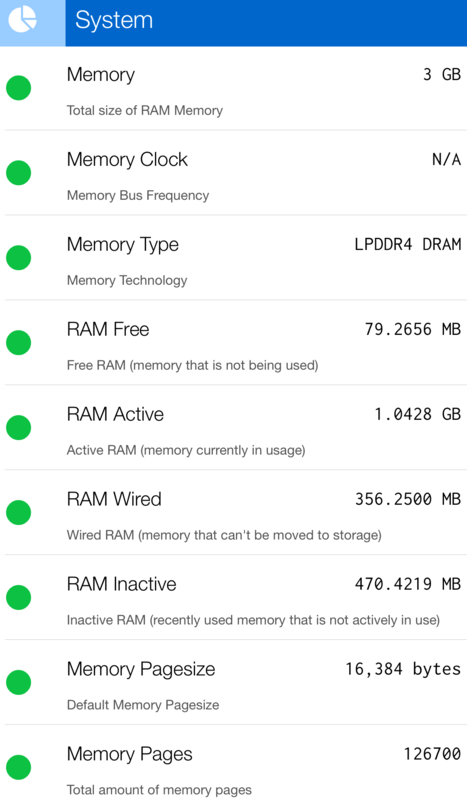 Is there a way to find how much RAM is installed in my iOS device? There are a number of free apps that will provide more information about your device’s internals. Lirium Device Info is one of the better ones. Note: I am not affiliated with this app or its developer. Go to EveryMac.com's Ultimate Mac Lookup, enter one of the listed iDevice numbers or identifiers, hit lookup and you will get the RAM size. Not the answer you're looking for? Browse other questions tagged iphone ios ipad memory . How do you find the UDID for an iOS device? Did they increase RAM in iPad 2? How to display/alter a jailbroken iOS device's route table? How do I check an iOS device's battery health? How do I find the installed RAM layout in my MacBook without opening it up? How to check how much RAM a program uses? Is there a peak RAM age? How much RAM do the different models of iPad have? How many RAM can i add and who are the manufacturer?